Non slip luxury cotton bath rug with sculpted design for extra style. 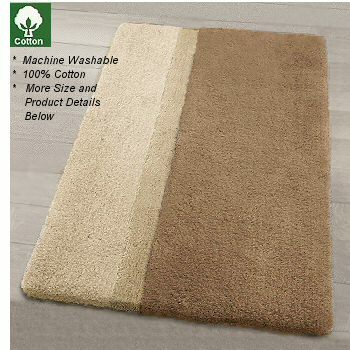 Abosorbent soft cotton rug with thick medium pile 20mm / .79in height. Durable and easy to care for. Machine wash and dry. See rug care details below. Taupe: Soft brown taupe cotton rug with light taupe accents. Anthracite Grey: Soft anthracite grey with light anthracite grey accents. Natural: Golden beige tone with very light beige accents.